Dottie Johnson, left, and Dawn Law, right. Dottie Johnson and Dawn Law grew up city girls- though both had ties to farming early on. Dottie wanted to be a farmers since she was 10 (with the 6th grade bibliography to prove it), and the best parts of Dawn’s childhood summers were spent on her grandparents farm. Both ladies ventured into farming eventually. 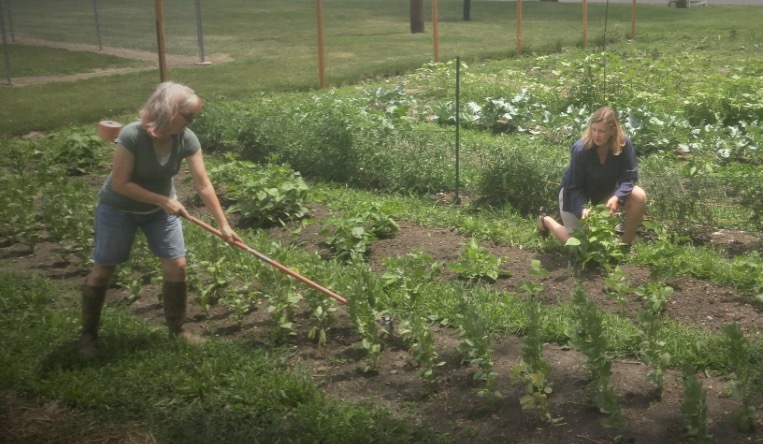 Dawn transformed her home’s doable lot into an urban homestead. 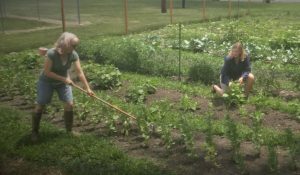 On Dottie’s small acreage in Milo, Iowa, you’ll find a few outdoor gardens, two high tunnels, plus miniature horses and miniature donkeys, sheep (some disabled), chickens, ducks, a dog, and cats (lots of cats). When these two kindred spirits met, they immediately recognized a shared passion for chemical free gardening. In 2015 they established 2 Old Broads Provisions, selling their produce at a “pop up” stand at a neighborhood bar’s corner lot. The following season they sold at the Historic Valley Junction Farmers Market and this season they are vendors at the Beaverdale Farmers Market. Their specialty is heirloom and unique product -ranging from Mouse Melons, heirloom spinach, Orach, and heirloom cucumbers, as well as pastured raised and organically fed chicken and duck eggs. Currently the ladies are hard at work turning the land of their new city plot, which they hope to have producing this season. These pesticide-free growers have even caught the attention of Chef White, Tim McGraw and Faith Hill’s personal chef, having specifically requested their fresh veggies for the couple’s Des Moines concert.